Many households across Canada own sterling silver flatware or silverware and silver tea sets. While it might be nice to bring out for afternoon tea, sterling silverware has dramatically increased in value due to its precious-metal content. It hardly seems worthwhile to have it sit there collecting dust when your silverware is worth so much! Many gold and silver dealers won’t accept silverware, as it presents some difficulty in testing. Most sets are silver plated, meaning they have just a tiny layer of silver coating the outside. Unfortunately we cannot purchase these sets because the silver content is so low compared to the total weight (the value in the silver would be less than the cost to refine it!). Canada Gold uses state of the art density and X-Ray Fluorescence and density testing to confirm whether your items are silver or not, allowing us to test and purchase any items with precious metal value. If you would prefer to know a bit more about your items before bringing them into one of our offices, you can check your silverware for some of the hallmarks and stamps listed here, then check the Online Encyclopedia of Silver Marks, Hallmarks & Makers’ Marks to find out what they mean. We understand that many people are unsure whether their silverware has any precious metal value or not, but don’t be shy. We are happy to test your items in one of our secure offices at no charge and you are under no obligation to sell. If the items are solid silver, we will present you with an offer which you are welcome to accept or decline. We understand that some items are sentimental and, even at today’s high values, are difficult to part ways with so there is never any obligation to sell. So where should you sell your flatware or antiques? Silver Flatware can be quite valuable for its precious metal content if it is made of solid sterling silver. 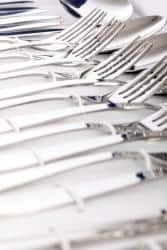 Note that most silverware we see is actually made with copper, nickel or brass plated with a very fine layer of silver over top. We are unable to purchase plated items due to the fact that refining plated items results in more fees than the plating is worth. Electroplated (EP) copper and brass flatware IS however recyclable and worth cash at other companies. Capital Salvage, located at 1919 Triumph Street in east Vancouver will purchase these items. Copper is worth approximately $2.60/pound and brass is worth approximately $1.75/pound. Stainless steel is also accepted but worth considerably less. Contact Capital Salvage at 604 253 8481 for current values and more information. Some plated flatware however should not be sold for scrap value. Depending on the age and condition, certain pieces could be considered vintage or antique and fetch considerably more than scrap value. Rogers flatware is something we see on almost a daily basis but because it is plated it is not something we can buy. One style they made however, the Eternally Yours style, dates back to 1941 and is highly collectible. Rogers (bros, sons) NOTE: Most Rogers pieces will have the year 1847 stamped on them. While it might seem like the year the piece was made (and not by accident! ), it is actually the year that the company started. Silver hallmarking can be quite in-depth. Typically we look for silver to be stamped with either the word STERLING or 925 indicating that the item is 92.5% silver. Depending on where the item was made however, the stamping may be slightly different and the purity may in fact be less than 92.5%. Other common purities for silver items are 80% (800), 83.5% (835), and 90% (900). A stamp indicating the purity of the silver is called the assayer’s mark. The mark for silver meeting the sterling standard of purity is the Lion Passant, but there have been other variations over the years, most notably the mark indicating Britannia purity. The Britannia standard was obligatory in Britain between 1697 and 1720 to try to help prevent British sterling silver coins from being melted to make silver plate. It became an optional standard thereafter, and in the United Kingdom and Ireland is now denoted by the millesimal fineness hallmark “958”, with the symbol of Britannia being applied optionally. The purity mark for Irish silver is the harped crowned. Each silver maker has his or her own, unique maker’s mark. This hallmark is usually a set of initials inside an escutcheon. The French assay mark for sterling silver is the head of the goddess Minerva. In fact, the French standard for sterling silver is higher than that of other nations, requiring a silver content of 950 parts per thousand, or 95% silver. Silver items with a slightly lower grade of silver, 800 parts per thousand, are marked with the head of Minerva, next to which is a “2”. French silver made for export carries an assay mark in the shape of the head of Mercury, along with a number to indicate the millesimal fineness: “1” for .920, “2” for .840 and “3” for .750. Prior to the general adoption of sterling silver as the standard of purity in 1868, silver was generally obtained from the melting of coins. Since these could vary considerably in purity, from around .750 millesimal fineness to around .900, silver known as “coin silver” varies in purity. Silver at that time was sometimes marked “COIN” or “PURE COIN”, but can also be without a standard mark altogether. After the adoption of the sterling standard, pieces were marked with “STERLING”, the number “925” or the notation “925/1000”. While American manufacturers did not apply assay marks, city marks or date marks, they did (and still do) apply a maker’s mark. For example, pieces from the Gorham company could be identified by a Lion Passant (or Lion Rampant, depending on the year), an anchor and the letter “G”. The letters “T. and Co.” indicated a piece manufactured by Tiffany and Company. Until 1867 the fineness of Austrian silver was indicated in “loth” (12 loth corresponding to 750/1000, 13 loth = 812/1000, 14 loth = 875/1000, 15 loth = 937/1000). From 1867 the silver fineness was indicated by a number beside “Diana head”: 1=950/1000 – 2=900/1000 – 3=800/1000 -4=750/1000 (the dog’s head used the same number system). Germany used the crescent moon and crown with a number to indicate solid silver and the purity. Mexico has a very extensive range of stamps. Taxco is one of the more common companies you will see. Italian silver hallmark. The number next to the head indicates the purity of the silver. The Russian standard for silver was based on ‘ zolotnik ‘. The name comes from ‘zoloto’ meaning gold. The unit originated as the weight of a gold coin of the same name which circulated as late as 11th century in Kievan Rus. Originally, a zolotnik represented a 1/96 of a pound, later 1/72 of a pound. In the metric system, one zolotnik equals 4,266 grams, 96 zolotniks equal one Russian pound.